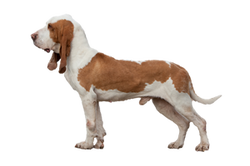 The Sabueso Español is a scenthound that was developed to hunt a variety of both large and small game in mountainous areas. They normally work singly with their hunter rather than in packs. Originally used for large game such as bears, boars, and wolves, as this game grew scarce they were adapted to hunt rabbits. Today the large game population has increased and this has returned to the use of the Sabueso Español on boar hunts. An ancient breed, the Sabueso Español is first mentioned in writing in the 14th century as hounds kept by King Alphonse XI. It is unknown how they arrived in Spain, although it has been suggested they are related to the St. Hubert (ancestor of the Bloodhound) or were brought by the Phoenicians or Celts. It may also have been used to develop the Old Spanish Pointer, which in turn influenced virtually all European pointers. At one time a smaller variety also existed, the Laberro,but it was extinct by the end of the 20th century. Is the Sabueso Español Right for You?